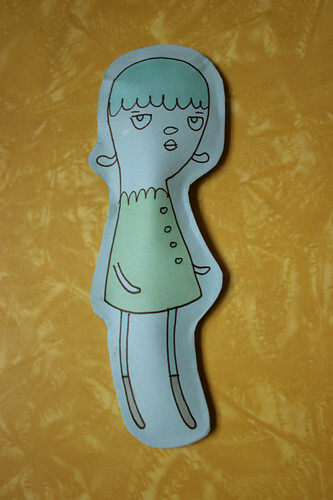 Here's a paper doll I made out of, um, paper. And polyester fiberfill and Alene's Tacky Glue. Paper is so inflexible that I couldn't really stuff the bejezus out of the doll like I normally do, but it still has a nice 3D quality. You can see the dimensional quality better in person (and in the side view). I'm knitting away on the Big! Body!, so I keep devising little toy diversions like this one. I think it's helping me break out of a bit of a rut. I recommend it... just start making little projects out of what you have on hand. Doing this paper doll made me think of making a toy in this style out of white tissue paper, so you can see the stuffing inside. Sort of a translucent doll. Isn't that craaazy? I can't wait to try it. 'Cause if Translucent doll is one fraction as cute as PaperDoll - you're going to want her to last! that plasticy stuff they sell to put over the top of tablecloths. It comes in different weights. I've also seen patterns for teddy bears made of nylon stockings where you buy a natural-colored cotton stuffing because it shows through. I like the idea of using vellum, though. This sorta reminds me of those old puffy stickers of the '80s childhood (in a good, non-'80s way).